Children’s Dental Health Month, an awareness campaign sponsored by the American Dental Association every February just came to a close. It was a time to reflect on your family’s dental habits. By taking good care of your kids’ teeth, you’re not just safeguarding their oral health but their overall health. Even though as dentists we encourage parents to have their kids brush and floss their teeth daily, the secret to your child’s oral hygiene might be in their lunchbox! Different kinds of food will have varying impact on your kids’ teeth. It’s therefore important that you understand which foods are good for your kid and which ones you should keep away from at all costs. Here’s an expanded list of foods that contribute to strong and healthy food. Naturally, apples are crunchy and are full of high fiber. 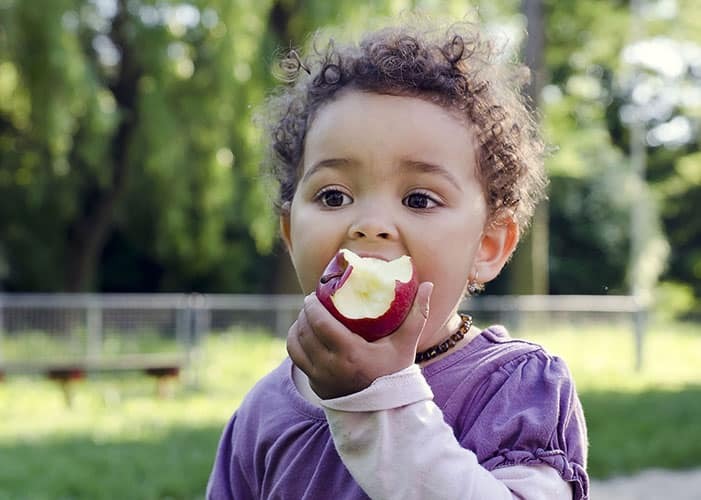 When kids bite and chew an apple, they scrub away any accumulating plaque from their teeth. Apples are also full of nutrients and provide your kids with minerals and vitamins. To grow healthy and strong the tooth’s enamel requires plenty of minerals such as calcium and Vitamin D. Eggs contain these nutrients plus protein. To keep your kid’s oral hygiene in top shape they need to consume enough vitamin D as it’s required in the absorption of calcium by the body. Fluoride plays a preventive measure against tooth decay caused by acid attacks originating from plaque bacteria. Given how much sugar kids normally take, it’s a no-brainer that your child should be taking water with fluoride. Worth noting is that even though drinking water usually contains fluoride not all varieties of bottled water have it. So be sure to check. Dairy products contain phosphorous, casein, and calcium. These minerals are essential for the protection of your teeth’s enamel. As a matter of fact, nutrients found in dairy products have been shown to neutralize acid that’s created by plaque bacteria. Nuts and seeds such as peanuts, cashews, and almonds contain phosphorous and calcium minerals which protect the enamel from decay and cavities. Celery and carrots just like apples need a lot of chewing which ultimately leads to a good teeth scrub. The fiber and water that are found in these vegetables not only clean the teeth but they also balance the sugars. Due to the high levels of minerals and vitamins found in green leafy veggies, kale and spinach are known to improve your teeth’s health. For the most part citrus fruits are very beneficial to your body as they are rich in vitamin C. However, lemon and grapefruits are very acidic and taken routinely over time can erode your tooth enamel. In addition, most fruit juices have very high sugar content even when they are certified to be 100% natural. Sugar is one of the leading causes of tooth damage. Bread and pasta are starches which are made from simple carbohydrates. Once broken down they become simple sugars which are capable of causing tooth decay. Instead of eating pasta and bread made from white flour, go for whole wheat options. If you’d like to consult with a Raleigh, NC dentist on which foods are best for your child’s baby molar teeth, feel free to get in touch.